The Department of Teaching and Learning would like to acknowledge Mr. Hose, of Maceo Horne Learning Center, for acting as an instructional leader within his school. In an effort to model expectations tied to the Teacher Keys Effectiveness System (TKES) standard of academically challenging environment, Mr. Hose demonstrated how to support students in writing from sources while setting high expectations for learning. Based on student interest in Black History Month, Mr. Hose challenged students to stake claim to a dream in the same fashion as Dr. Martin Luther King, Jr. For this writing prompt, students had to cite evidence across multiple texts to support their thinking tied to personal dreams and dreams for the country. As a way to facilitate student growth toward meeting standards-based expectations, Mr. Hose spent time conferencing with students to give feedback on next steps using language of the standards. We salute you, Mr. Hose, for modeling the way to set high expectations for student learning. This is powerful! 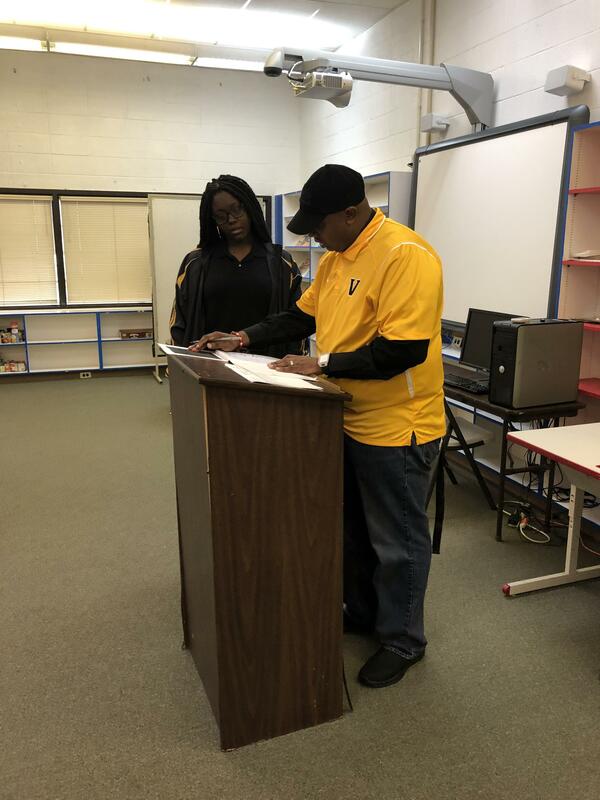 The Department of Teaching and Learning would like to acknowledge Mr. Duren, of Valdosta Middle School, for creating a positive and academically challenging learning environment for seventh grade students. In an intentional effort to engage learners, this teacher capitalized on student interest by writing a standards-aligned rap song about the Asian government. Further, Mr. Duren performed the rap on video for students to watch multiple times, as wanted or needed. 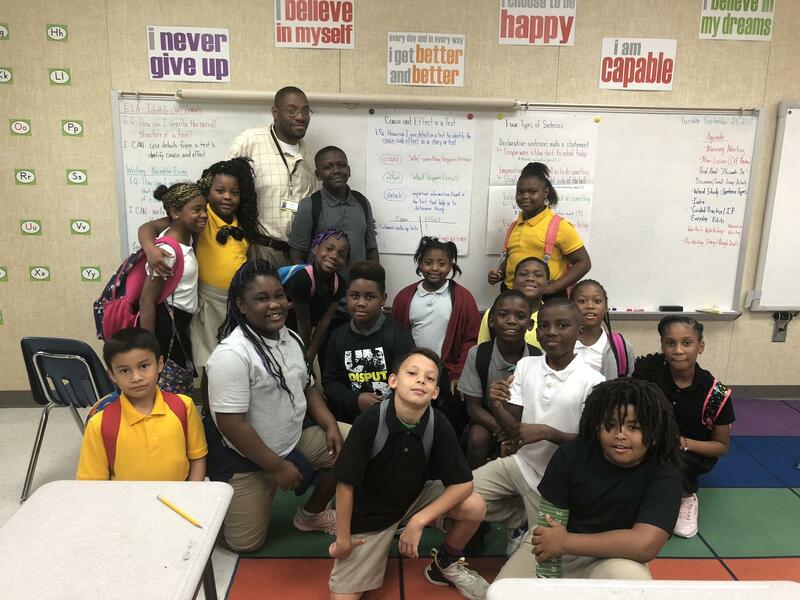 We applaud Mr. Duren for his innovative approach to social studies instruction. By going the extra mile, this teacher increases the likelihood that learning will "stick" for students as the content is presented in a way that is engaging. Keep up the great work! 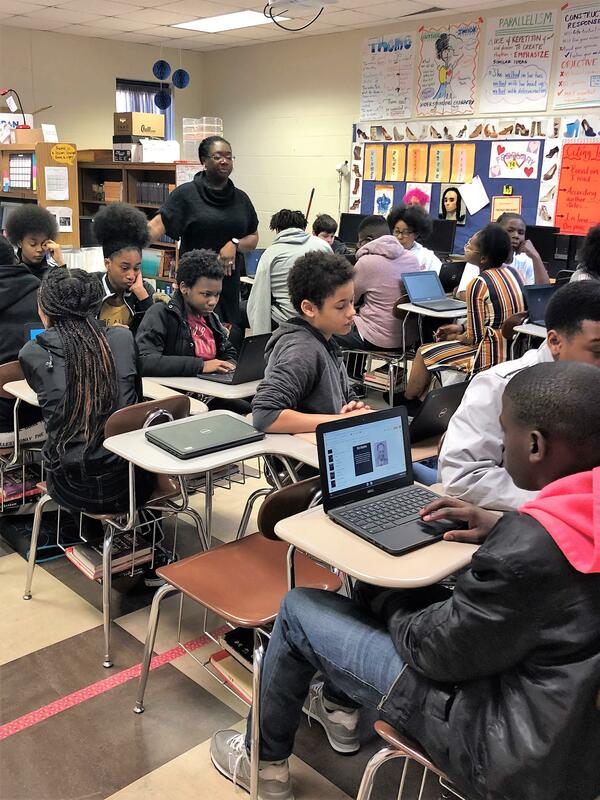 The Department of Teaching and Learning would like to acknowledge Mrs. Cooper, of Newbern Middle School, for creating opportunities for learners to monitor progress tied to the standards. 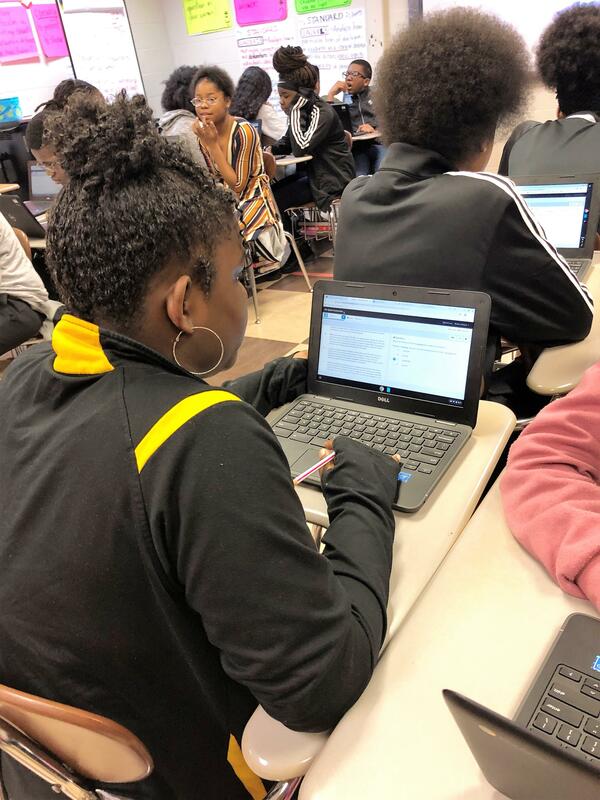 Using the newly integrated Illuminate assessment platform, Mrs. Cooper challenged her 8th graders to respond to standards-based questions that mirror those that will be found on the Georgia Milestones Assessment System (GMAS). Students received immediate feedback on whether answers were correct or incorrect. Following a quick review of the data, students had to "speed discuss" with a partner their rationale for the answer choice. If correct, students provided a rationale for their answer. If incorrect, students had to explain what they needed to do to be successful. 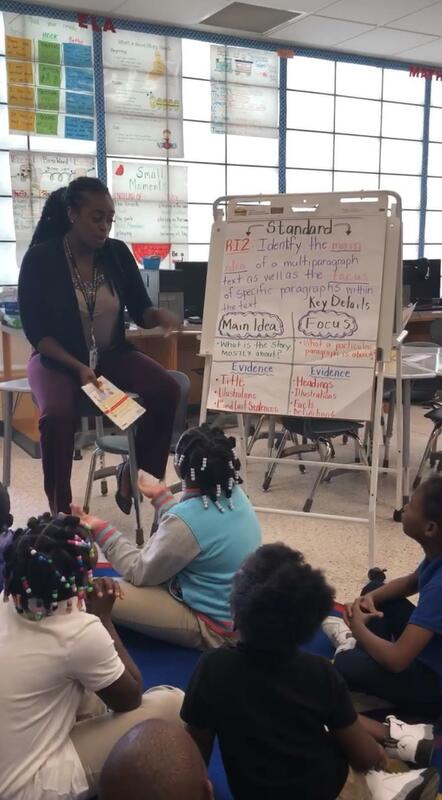 Using this student-centered approach, this teacher created countless opportunities for students to use language of the standards in an authentic context. 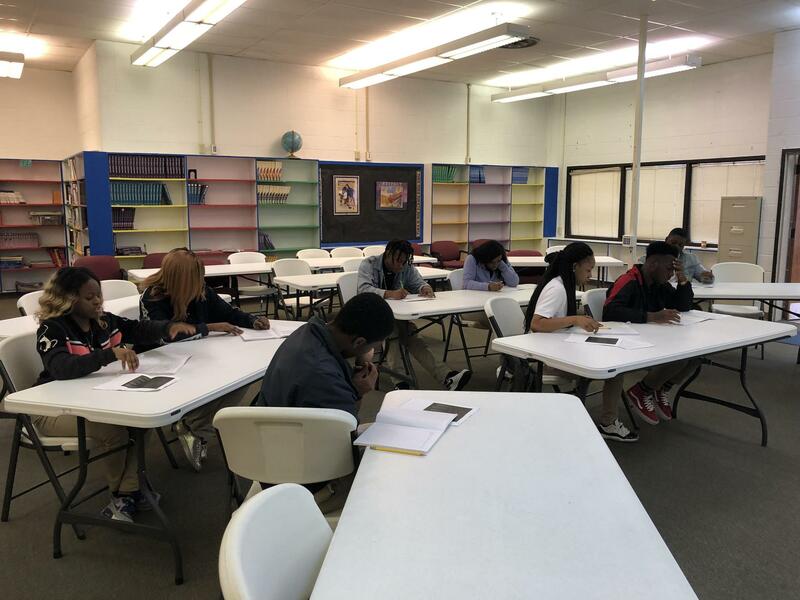 Job well done, Mrs. Cooper, for teaching the testing genre to ensure that your students are college and career ready! The Department of Teaching and Learning would like to acknowledge Mrs. Taylor Hoes, of W.G. Nunn Elementary, for setting high expectations for student learning. 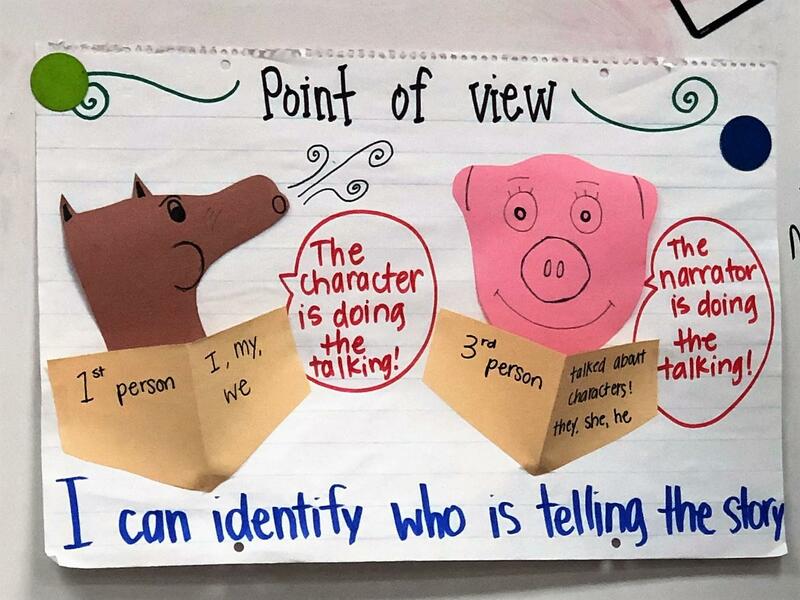 Using authentic children's literature, this teacher prompted first grade students to search for text evidence to support their thinking tied to the point of view communicated in a story. 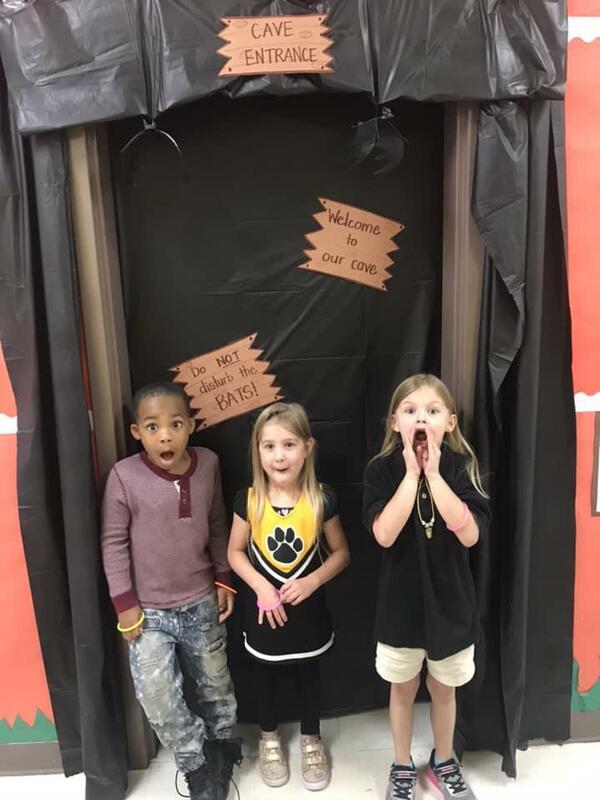 Through integration of student-generated resources (anchor charts) and children's literature, Mrs. Hoes created an unforgettable learning opportunity for students while setting high expectations. We would also like to acknowledge Mrs. McGee, of W.G. Nunn Elementary, for supporting students in strengthening reading abilities using the evidence-based approach of guided reading. 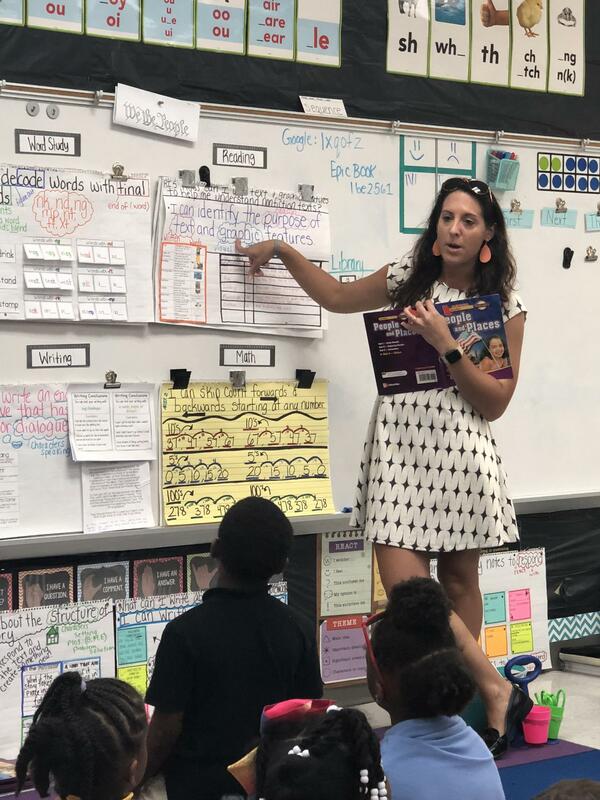 With intentional conferencing as children read aloud to her, Mrs. McGee gave specific feedback tied to the meaning, structural, and visual cueing systems to strengthen student ability. We also saw students engaged in standards-aligned differentiated independent work tied to the mini-lesson. By giving students choice based on learning style, Mrs. McGee increased the likelihood of engagement through differentiated instruction. 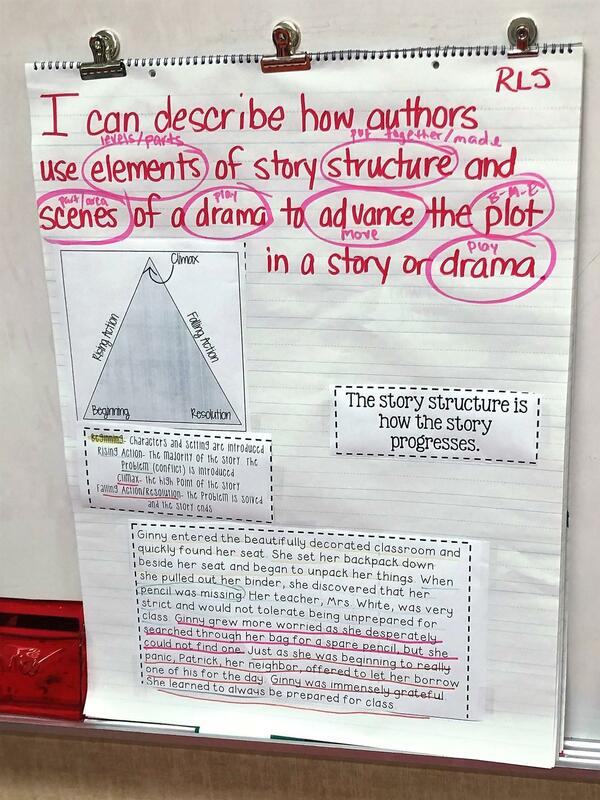 Students could choose to describe how an author used elements of story structure with words or by color coding the text. Hats off to these two amazing teachers! Keep up the great work! 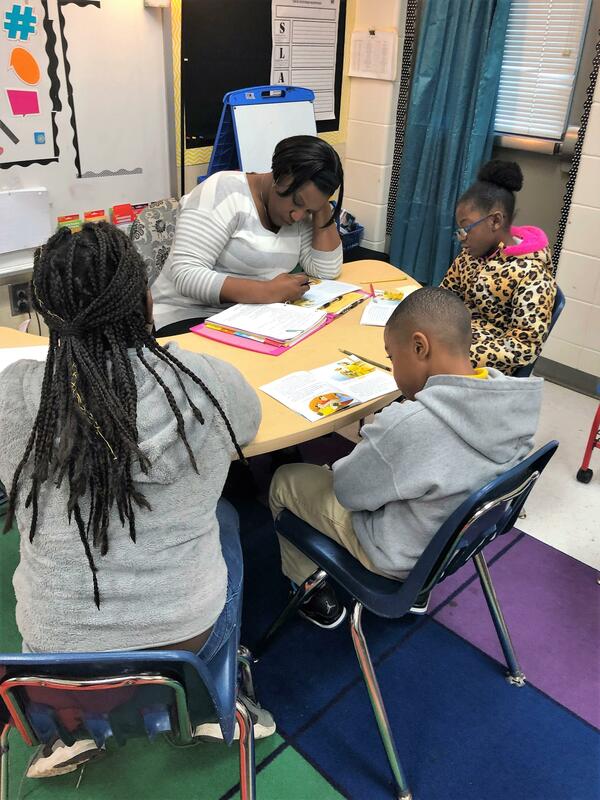 The Department of Teaching and Learning would like to acknowledge Mrs. Carol Kemp, of Sallas Mahone Elementary, for engaging third grade students in cross-curricular standards-aligned learning opportunities. 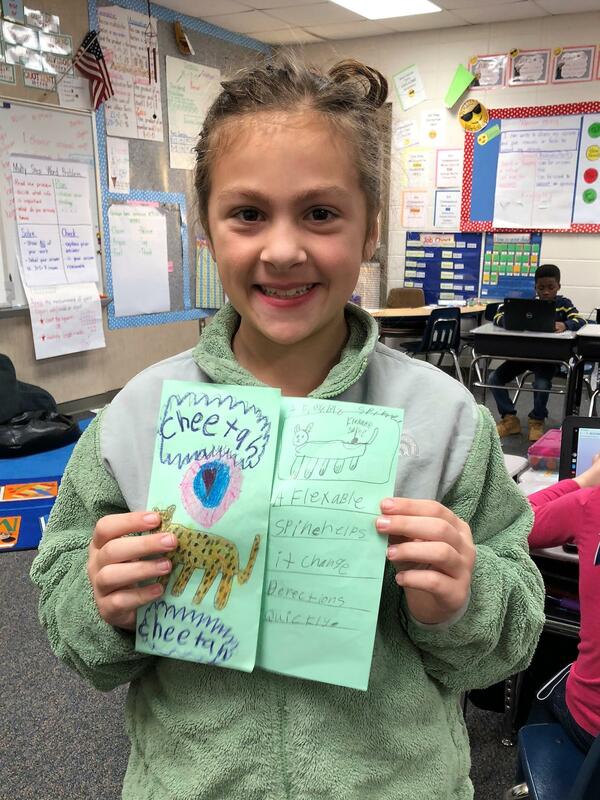 Following an informational text unit of study, Mrs. Kemp asked students to use the unique text format of a brochure to showcase learning tied to specific animal adaptations. 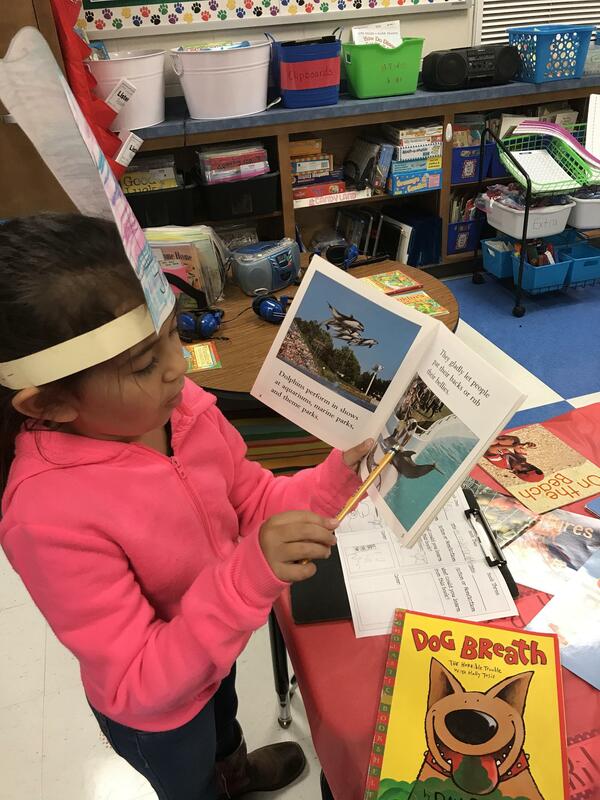 As students were reading and writing to meet the informational standards, they were simultaneously accessing science content. Thank you, Mrs. Kemp, for maximizing instructional time with your students. We love to see authentic learning! 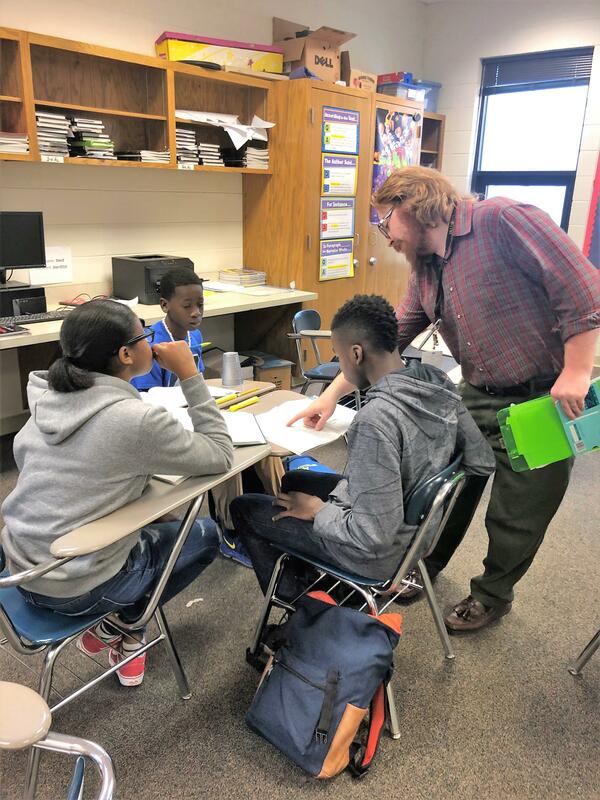 The Department of Teaching and Learning would like to acknowledge Valdosta Middle School teacher, Mr. Crosby, for supporting standards-based teaching in his classroom. 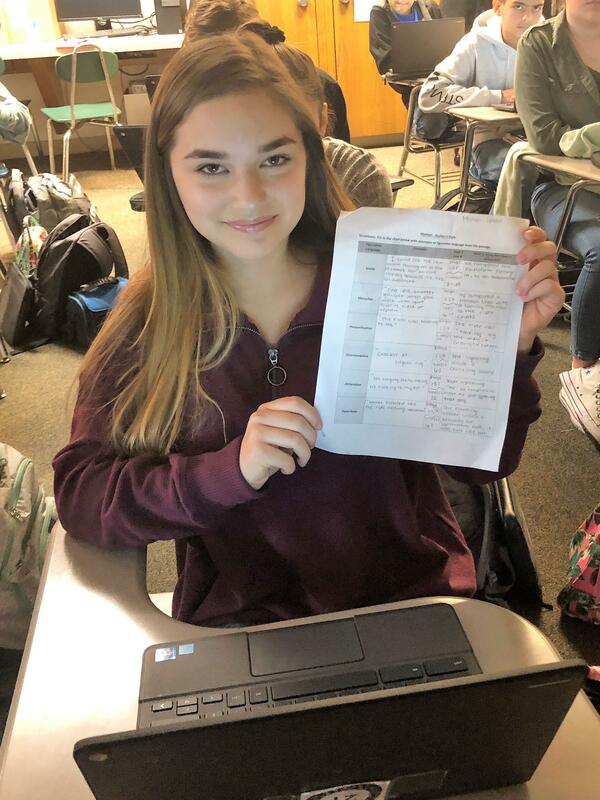 Using a graphic organizer, Mr. Crosby prompted students to analyze traditional and digital memoirs in search of figurative language including similes, metaphors, personification, onomatopoeia, alliteration, and hyperbole. As a follow-up, students were asked to emulate the figurative language used in texts previewed within their own writing. It was exciting to see students actively engaged in the writing process and buying into the idea that texts provide support for us to generate ideas for writing. Job well done, Mr. Crosby! In another classroom, we observed first-year teacher, Mr. Smith, promoting rigorous, standards-based instruction. 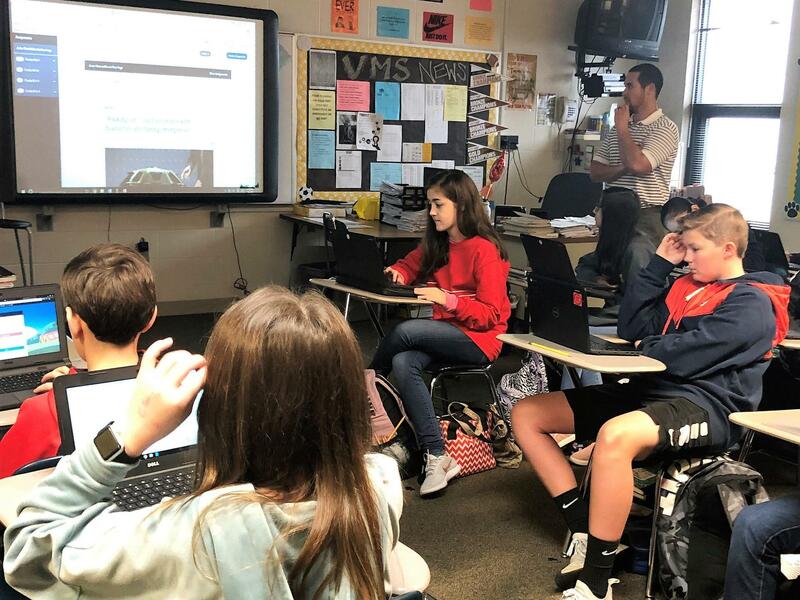 Using a student-centered instructional design, 7th graders collaborated in their effort to read and understand text based on standards-aligned questions provided by Mr. Smith. It was most exciting to hear students articulate success criteria. In one instance, a student shared that in order to meet Mr. Smith's expectation, he had to "cite textual evidence." We also observed students independently using dictionaries to determine the meaning of unknown words and asking if a statement could be considered a hyperbole in an effort to find meaning in text. We applaud this intentional effort by both of these Valdosta Middle School teachers. With this effort, we expect to see students take off. Keep up the great work! 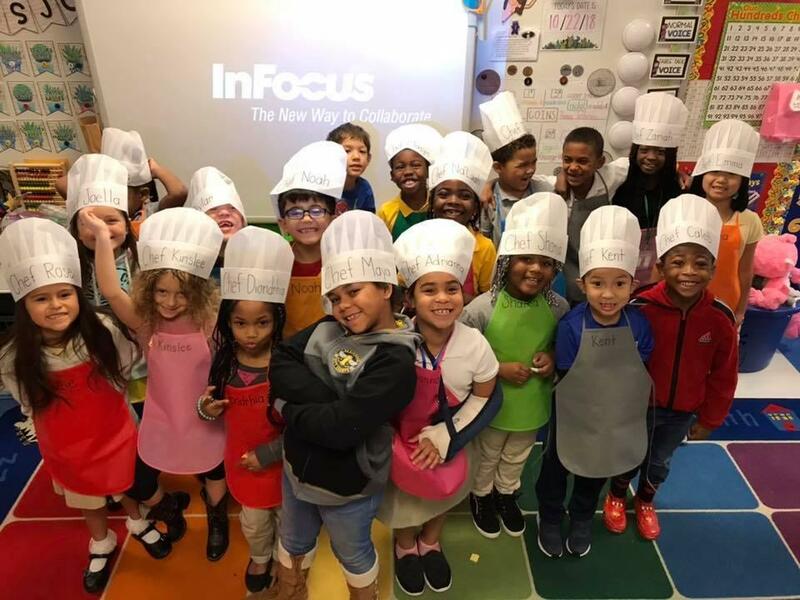 The Department of Teaching and Learning would like to acknowledge 2nd grade teacher, Mrs. Norwood, for challenging her students to use genre-specific writing to form an opinion supported with reasons. When asked how his teacher would know that he did a good job, one student responded that his teacher would look for an opinion with reasons to support his thinking. Bravo, Mrs. Norwood, for providing success criteria for students using language of the standard! 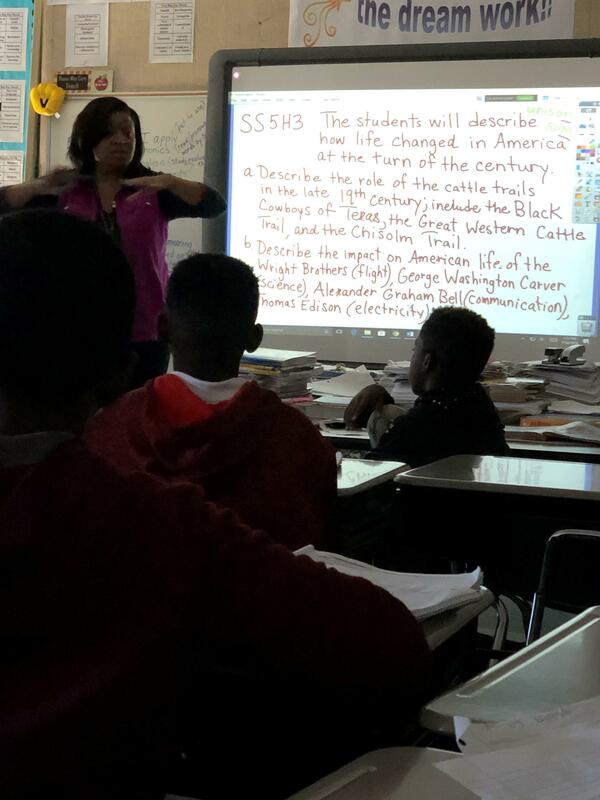 In another classroom, we observed Mrs. Robinson deconstructing a social studies prompt to address the English Language Arts standard tied to determining the meaning of unknown words. This was a fabulous opportunity for cross-curricular teaching. Hats off to these awesome teachers, at J.L. Lomax! The Department of Teaching and Learning would like to acknowledge Ms. Lindsay of S.L. 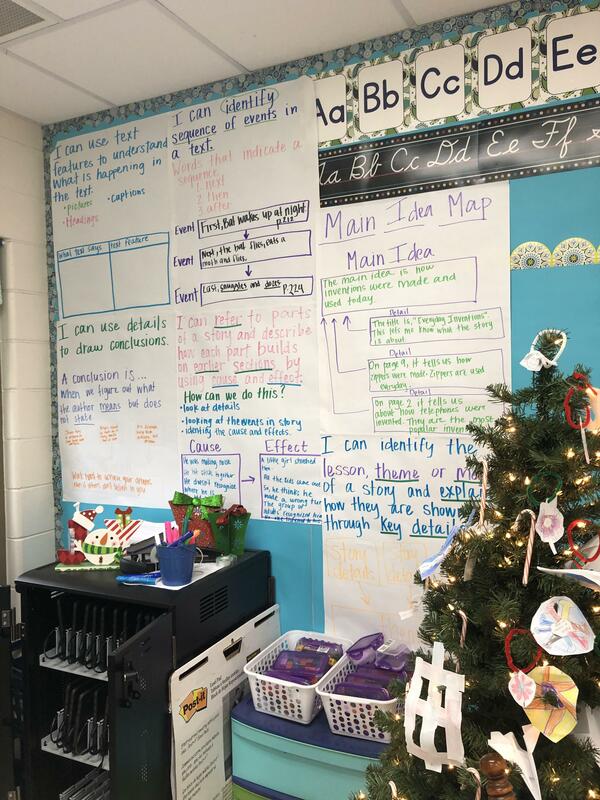 Mason Elementary School for challenging her third grade students to consistently apply knowledge of the standards through integration of anchor charts. Mrs. Lindsay models for students and posts the anchor charts expecting students to use the resources for routine writing and discussion about texts. 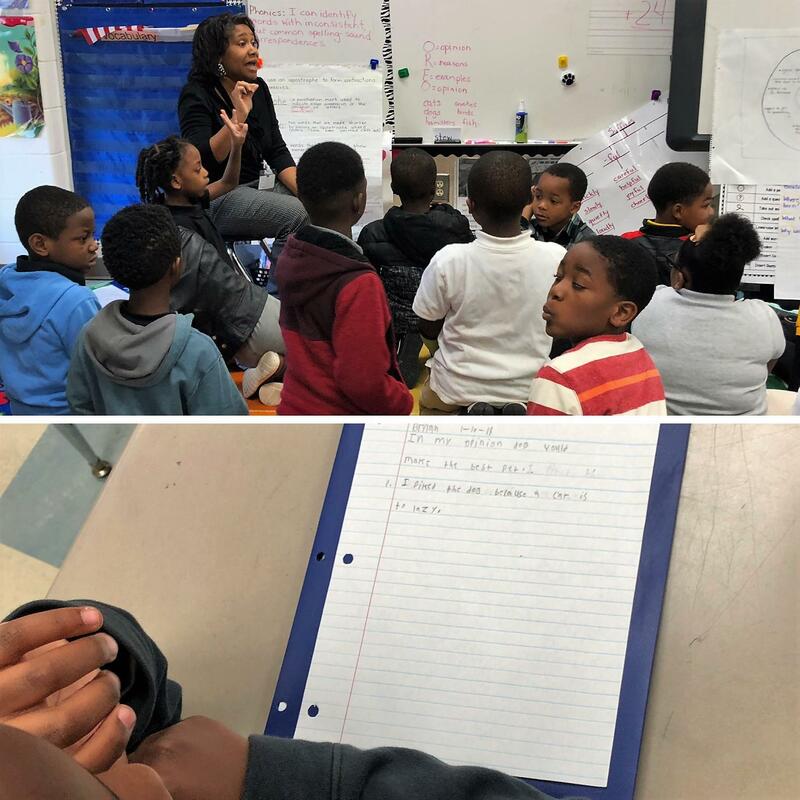 In a recent writing lesson, students were also able to readily recall what constitutes narrative writing using academic language such as sequence of events, conflict, resolution, and dialogue. We celebrate you, Ms. Lindsay, as you promote student ownership of learning through consistent standards-based teaching! Keep up the great work! 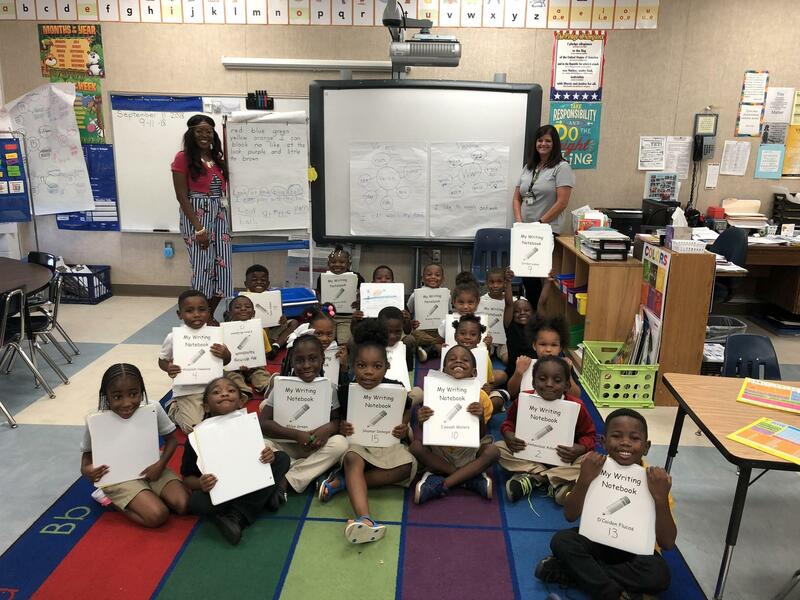 The Department of Teaching and Learning would like to acknowledge Mrs. Brantley of Sallas Mahone Elementary School for supporting her kindergarten students in identifying a main topic and retelling key details. 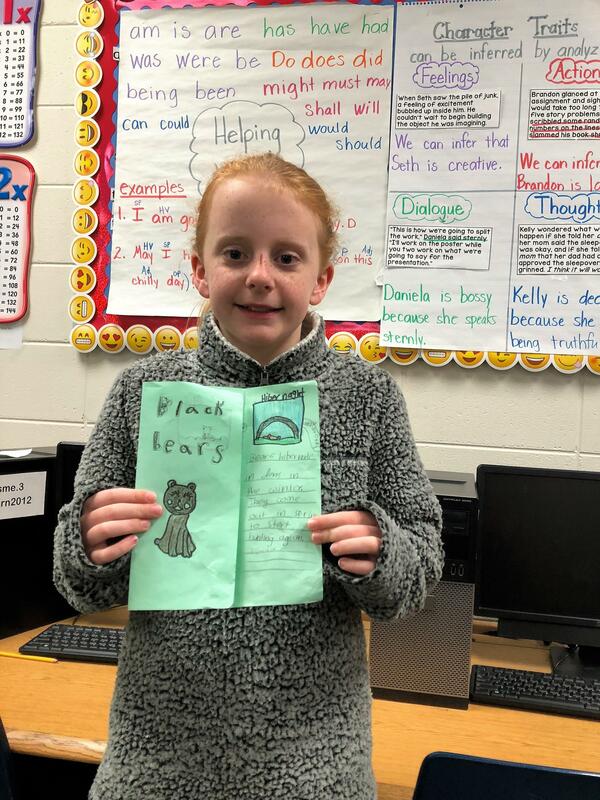 Using the mentor text, Stellaluna, Mrs. Brantley generated a "can, have, are" chart to support students in generating ideas for informational writing on the topic of bats. We applaud Mrs. Brantley for helping students to see the reciprocal relationship between reading and writing. Job well done! The Department of Teaching and Learning would like to acknowledge Sallas Mahone Elementary (SME) first grade teachers for providing student choice in informational text selection during reader's and writer's workshop. 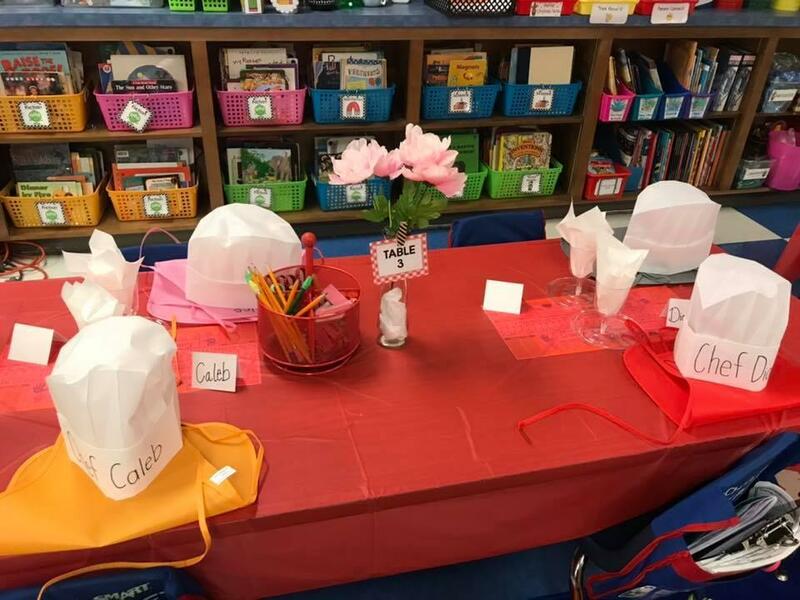 Along with the other first grade team, Mrs. Coile and Mrs. Sigers provided an authentic application for reading and writing skills in the context of a restaurant. The first grade team provided varied levels of text and topic choices to give students the opportunity for choice. This increases the likelihood of engagement. 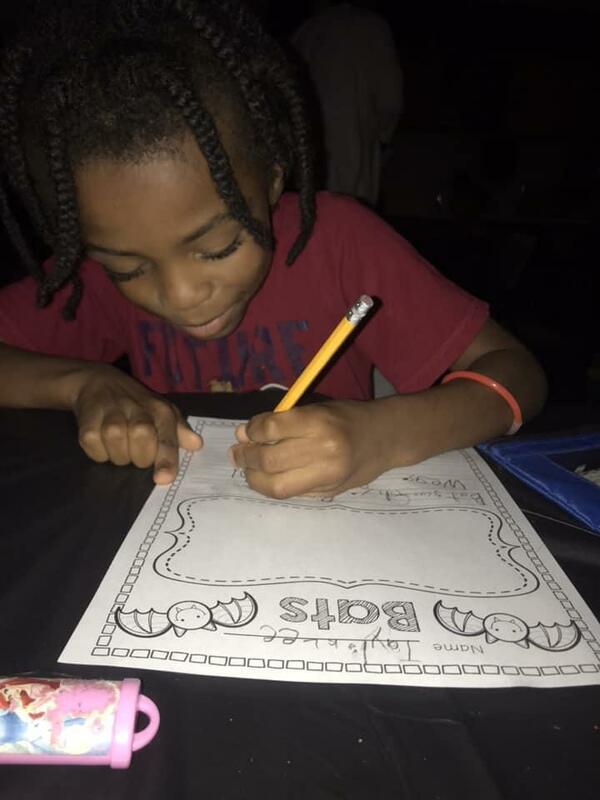 Within the restaurant where a "book tasting" occurred, students also had to apply knowledge of pennies and dimes when reading a restaurant menu. We are so proud of the standards-based literacy and math authentic application opportunities that you are providing! Job well done, SME! 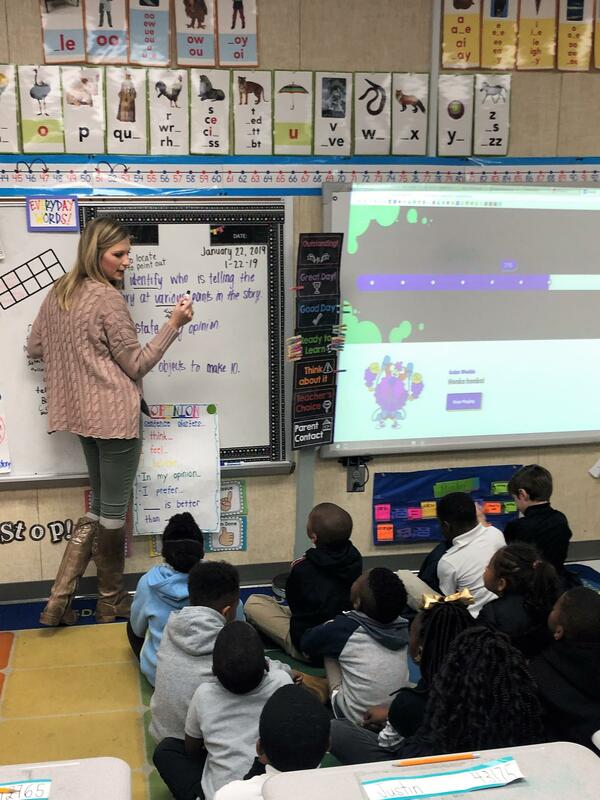 The Department of Teaching and Learning would like to acknowledge Ms. Ward, of Pinevale Elementary School, for challenging students to think critically in a standards-based classroom. 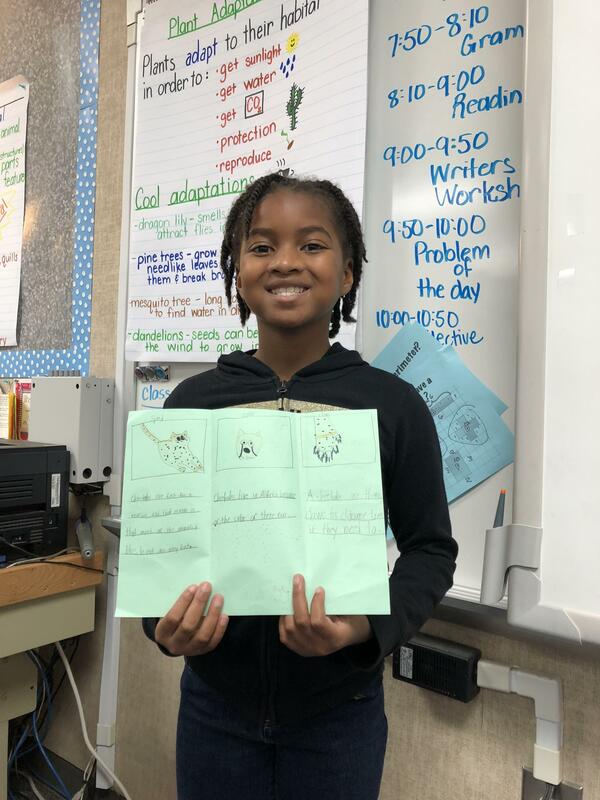 We are excited to see that she requires her 2nd grade students to provide text evidence to support thinking as showcased in this short clip. Job well done! The Department of Teaching and Learning would like to acknowledge Mrs. Dobard and Mr. Solomon in 4th grade. We applaud the use of anchor charts to articulate clear learning targets to students. 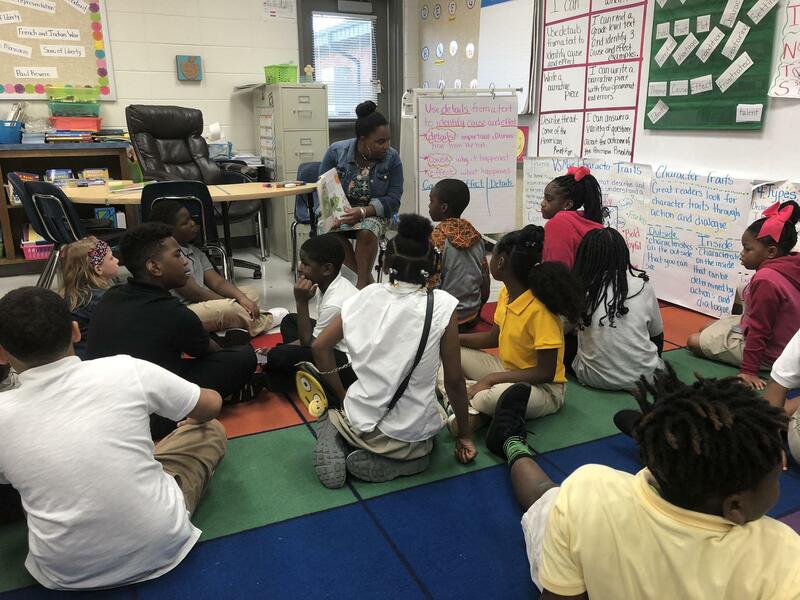 Using authentic children's literature, these teachers were teaching students how to use higher order thinking skills to identify cause and effect in context. We also captured Mrs. Worrell teaching her 2nd grade students via cross-curricular standards-driven teaching. 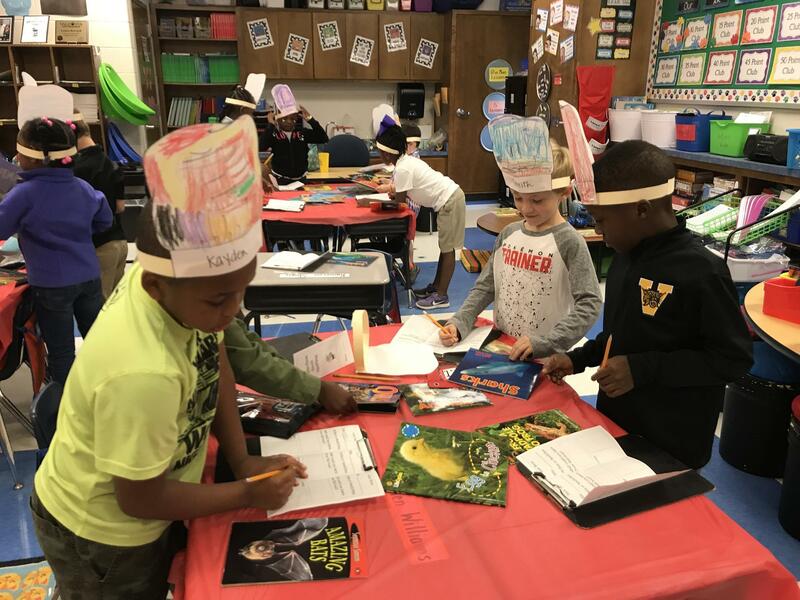 Using a text addressing social studies content, Mrs. Worrell prompted students to use informational text features to answer questions tied to the topic of people and places. Onward, W.G. Nunn! The Department of Teaching and Learning would like to acknowledge Mrs. Roberts at J.L. Lomax Elementary School for supporting kindergarten learners in a standards-driven writer's workshop. Using a thinking map, Mrs. Roberts prompted kindergarten learners to build on existing knowledge by requiring students to brainstorm verbs that begin with the letter W. The students used this list of brainstormed verbs as a resource to apply phonics and grammar knowledge in the context of writing as evidenced by their writer's notebooks. Way to go, Mrs. Roberts!